The following is an email sent out by Color of Change regarding the harsh and severe punishments being meted out to the 11 and 12 year old children of the Beaumont Bulls football team as well as their parents and coach. Since the young men decided to engage in a silent protest following Colin Kaepernick's lead by kneeling during the National Anthem, they have been subjected to horrendously racist abuse and death threats from people from outside (and within) the community. Now they are being subjected to even more vile punishment after their entire season was cancelled by the League, and their parents are being threatened with arrest, all because they wouldn't be subservient and stand for the National Anthem and the oppression it represents. Demand the executive board revoke it’s unjust punishment of these children, their parents, and coaches. 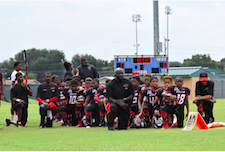 After these kids knelt during the anthem to protest police violence against Black youth, their local executive board canceled their entire football season, suspended the coaching staff, and threatened to arrest their parents if they attended any future games, practices or events. This is the most disturbing punishment of a national anthem protest yet. Canceling these kids’ entire season and threatening to have their parents arrested is a gross response to a silent protest asking for basic rights and dignity.The executive board that handed down this punishment and threatened these families with police violence for attending their children’s football events must be held accountable. Demand the executive board immediately reinstate the Beaumont Bulls coaching staff, apologize to the boys and their parents, and allow them to finish their season. Police brutality, wrongful arrests and racial violence plague these children in their town of Beaumont, Texas. Within days of Colin Kaepernick’s protest, the team’s coaching staff, privately discussed the possibility of them taking a knee before their next game, before ultimately deciding against it. The coaches didn't want to impose anything on the players. To their surprise, though, the young boys came to them and told them they wanted to take a knee. The shooting deaths of Alton Sterling and Philando Castile at the hands of police just two months prior had deeply bothered the young students. For these young Black kids the plight of injustice in America is their own. Instead of supporting the boys and their protests, their executive board and league officials abandoned them. The board has decided to strip these kids of the team that they love to punish them for asking for basic rights and dignities. This is about the board reinforcing that police violence in our communities doesn’t matter, that our issues aren’t important and that speaking on them makes you subject to punishment. For these kids, playing on a football team together is likely one of the few places they can step away from the racial injustices they face everyday and just be themselves. But now, that has been unjustly taken away from them in an attempt to deprive them of their dignity and humanity. --Brandi, Rashad, Arisha, Anika, Evan, Bernard, Jade, Corina and the rest of the Color Of Change team. The Beaumont Bulls football team has been subjected to racist abuse, death threats and cancellation by the League all because they wouldn't stand during the National Anthem in protest against a national epidemic of police violence.